On Sunday, Oct. 10, Maurine Pederson started her 61st year of church organ playing. As she has so many times over the past decade, she celebrated that day by playing the organ at not just one, but two, local churches. At St. Stephen's Episcopal Church, where Pederson has played since 1970, the congregation surprised her with flowers and recognition for her 61st year. She was shocked to be honored, since she had only mentioned her 61 years of organ playing in a passing remark to the Rev. Doris Dodds. "I was shocked," Pederson said. "I was astonished. But it was really nice. They made me feel very special." Pederson, who grew up in Worth-ington, started playing the piano when she was five. She started playing the piano in church - not all churches in those days had organs - at age 13. While still in high school, Pederson taught piano lessons. She started playing the organ right after her 18th birthday in October 1943. She took organ lessons at St. Olaf College, where she took music classes and intended to major in music. While attending St. Olaf, she would play for church on Sundays either in Worthington (her hometown) or in Minneapolis (where she had relatives). 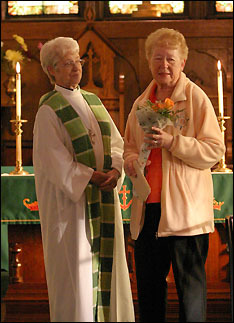 Maurine Pederson (right) received flowers and recognition from St. Stephen's Episcopal Church and the Rev. Doris Dodds (left) this month when she marked her 61st year of playing the organ in church, including 34 years at St. Stephen's. She came to Paynesville with Don in the 1960s when he took an administration job at the school. She played organ at the Methodist church in Paynesville until it merged around 1970 and then she started playing at St. Stephen's. Maurine, in 1990, started playing at Nordland Lutheran Church, too. She also accompanies various groups at the Paynesville Area Center, including the Centrist Choir and the Directors. She also taught piano lessons for 13 years in Adrian (15 years in all) and directed church choirs for 20 years. And she played piano on a radio program in Worthington, called "Ebony and Ivory," in the 1940s, she said. Though she knows a lot of hymns after six decades of organ playing, Maurine still practices every week. "Even if it's something I've played hundreds of times, I still go over it," she said. Seven or eight years ago, Don bought Maurine a church organ, so she could practice at home. Actually, her late husband loved to sit and listen to her play, she said. Pederson has no plans to retire from organ playing. "It's just relaxing. God gave me a talent, and I need to use it. Other people seem to enjoy it, and that's pleasing, too," she said. Away from the organ bench, Pederson enjoys knitting, crocheting, working at her sewing company, which makes hockey jerseys, and spending time with her two sons and three grandchildren.